I beat Super Adventure Box, World 1 in Tribulation Mode. Where to even begin? It’s not overly hard. Yes, there were spots where it took quite some time to get that right line and jumping precision. There were plenty of places I found “unfair”, such as Zone 1’s rock path right after checkpoint 2. Jeromai muses more on the the concept of “hard” in Tribulation Mode, and I think he comes to the right conclusion. It’s more about time than difficulty. How quickly can a player find that right path? Going back to the rock path for the first few rocks I noticed that the rock’s response time seemed dependent on where I landed and what angle I came in on the platform. The less of the platform under my feet and the more precarious the angle seemed to make the rock unsure whether to ground pound with the resulting invisible shockwave of death. The later rocks were more easily foiled with a dodge aimed directly at the rock. I figured out that part of the puzzle, and all of the sudden unfairness was not an issue since I saw that narrow lane where it was very fair (and beatable). 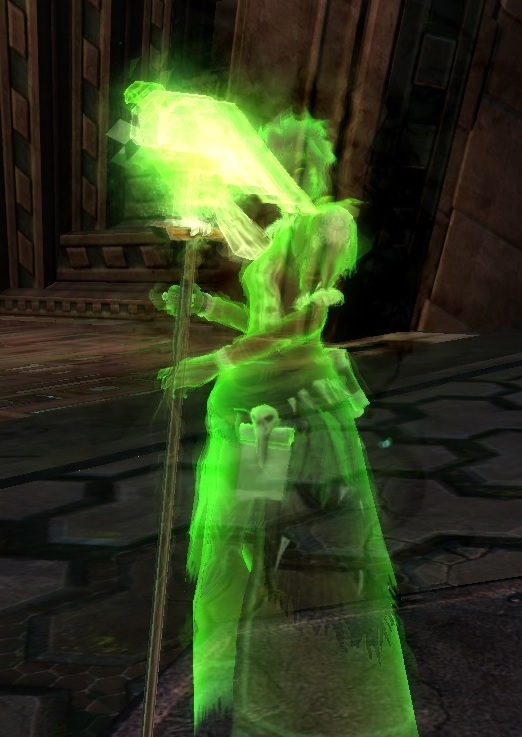 One big complaint I’ve seen here and elsewhere is how the Guild Wars 2 engine is not really good for jumping puzzles, especially ones requiring a very narrow path. I kept this in mind the entire time I played Tribulation Mode, and the conclusion I came to was that it was all part of the unfariness of that mode. Perhaps it is better to rage about the horrible camera angle in normal mode, but in Tribulation Mode I felt that it was part of the whole puzzle. Those that jumped before me also had to deal with it, and they succeeded. Therefore, I am capable of succeeding through it too. It is certainly not for everybody. Doing my daily empyreal fragment runs, I silently rage every time I do Troll’s End in Lion’s Arch. The puzzle was created especially for the limitations of the engine. The creator, I believe it was Josh Foreman, wanted it to feel claustrophobic with players uncertain if they were jumping accurately. I have Troll’s End on farm mode now, but the unfairness of the situation still gets to me. When I cross over the dead troll’s body, I shake my fist at the designer who did mess with my mind. I like Guild Wars 2 jumping puzzles because it is clear they were designed with the limitations of the engine in mind. Even if they are not good “platformers”, I find them good challenges within the system. The fun of it is obviously more subjective, but ArenaNet is giving developer time towards more jumping puzzles so their player activity is not much in question. I am not sure how much further I want to go in Super Adventure Box this time around. I beat World 2 in normal after the amazing 13th hour modifications. It was more difficult than World 1, but not that much. I am pretty sure I am not going to get to Tribulation Mode in World 2 this time, but the bauble and secret achievements are on the fence. I’ve had a good fill of a pretty heavy meal. Mrs. Ravious (who hates jumping puzzles) seems to be having a lot of relaxed fun with the champion farming circuits. She catcalls me at the end of each night telling me how much gold she made (working towards Leaf of Kudzu), and I look at my small pile of baubles with no response. I am pretty sure the tides of Tequatl are going to sweep my attention away from Super Adventure Box either way. They made it easier? I was having a heck of a time trying to beat World 2 on Infantile, to be honest. I couldn’t picture myself doing it in Normal. There was a patch last week that removed many geysers, made the remaining ones permanently spouting, made the flower jump pads reliable, and buffed the drop values from several types of enemies. 2-2 and 2-3 are still tough, and especially the Gong Pagoda and Storm Wizard are still probably /too/ difficult in normal mode, but it’s significantly more reasonable than it used to be. All that rampant gold farming of the last patch is getting evened out in my case. I just don’t have the patience or reaction skill for the SAB puzzles. I do enjoy the world jumping puzzles but even some of those hit my personal frustration limits. I remember a clock tower jumping puzzle from last year which I found totally obnoxious and abandoned it after 15 mins of frustration. Luckily there are lot’s of other activities to do in GW2.